I’m gonna show you an easy twisted braid.This is kind of a messy look .For this you gonna need hair elastics. •Firstly, side part your hair and with some section of hair in the front make a lace braid and tie it with an elastic. •Now grab two small sections of hair from either sides ,tie it with an elastic and flip that small pony inwards.Pull some hair from that to make it look more messy and voluminous. 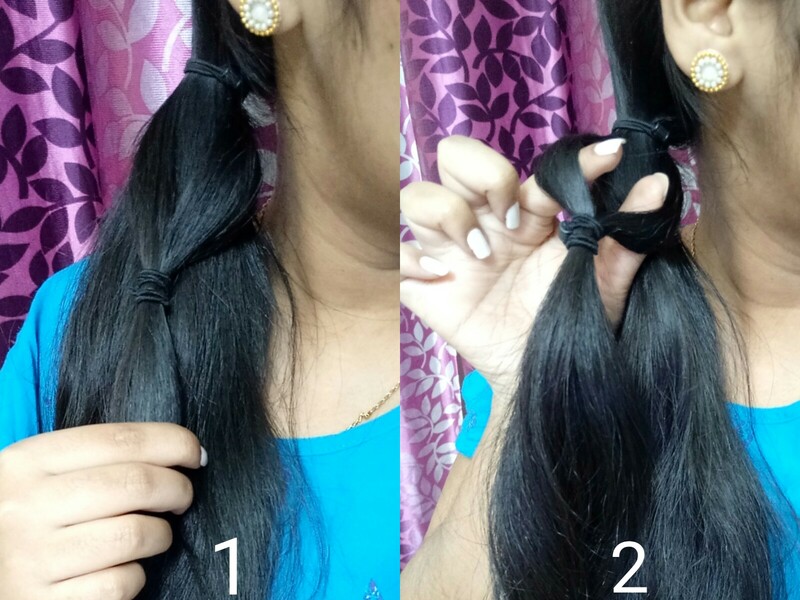 •Again take two small sections from either side,now tie them to the left side and flip the pony.Next,again take two sections,tie them to the right side and flip the pony. •Continue doing this to your entire hair,tying sections once to the left and then right and flipping them. •Lastly secure it with an elastic.Grab small piece of hair and wrap it around the elastic just to hide it and pin it in place. 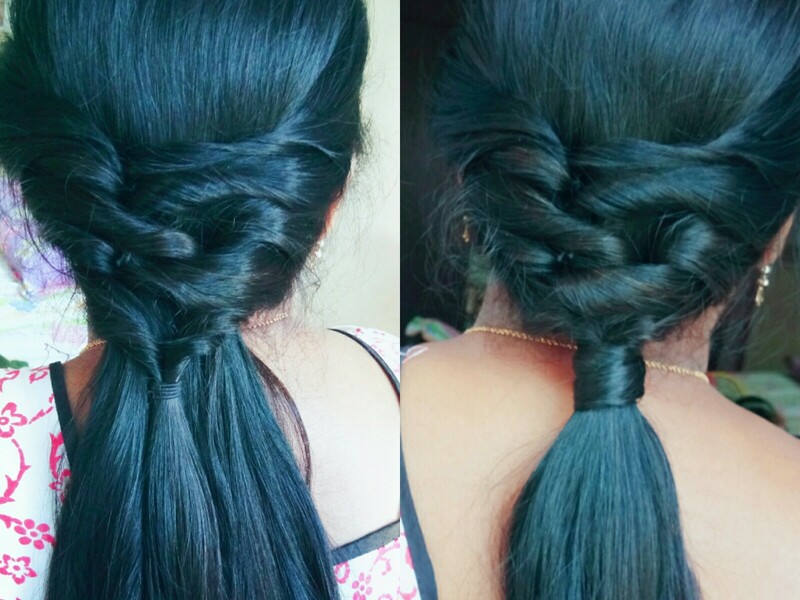 This is the final look of this braid.I hope you’ll give this a try. Many of you guys might feel difficult in braiding you hair so today I’m gonna show you 2 easy elastic braids, for this you don’t need to braid your hair. Just grab some hair elastics and let’s get started. For this braid all you need is a comb and some elastics. Side part your hair and tie your hair into a side pony tail. Now take two small sections and secure it with an elastic . Make sure that is tight (for demo purpose I made it loose). Now flip that small pony tail inwards and just pancake it. Again take another two small sections and tie with an elastic and flip that small pony tail inwards. 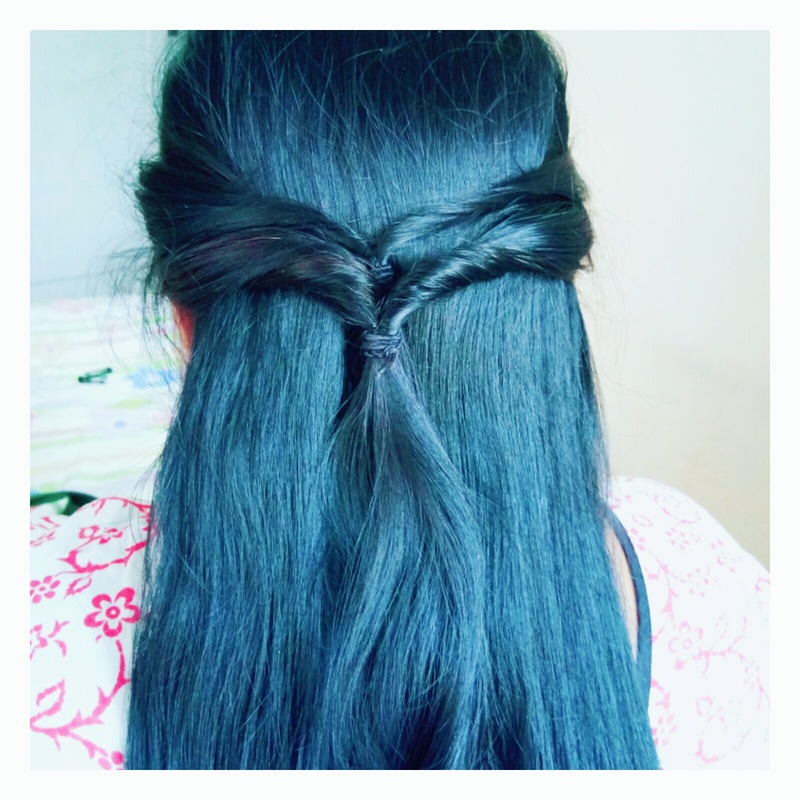 Continue doing this to the whole hair and you’ll get this simple elastic braid. 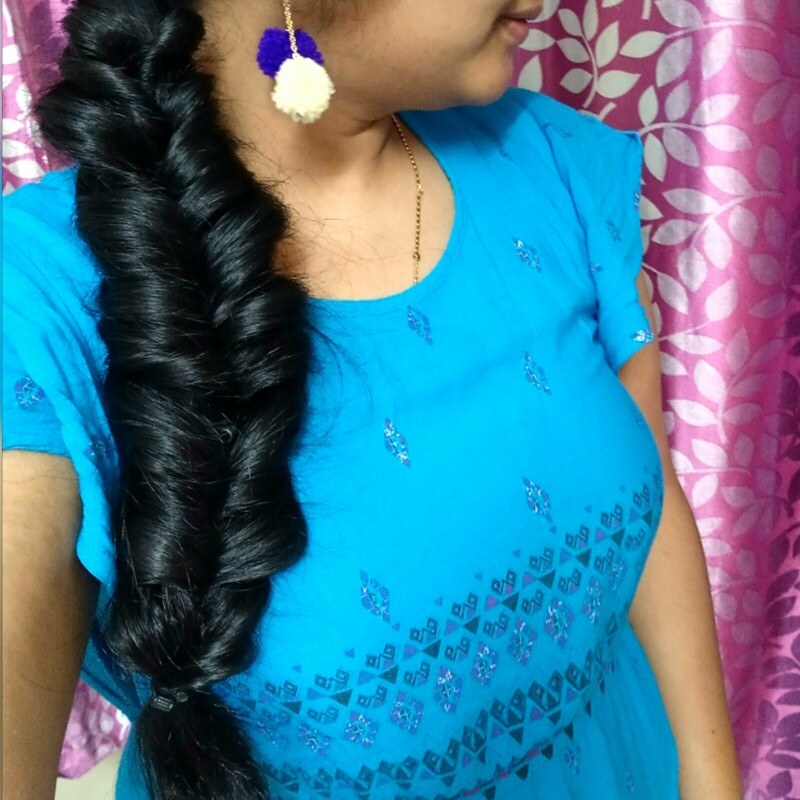 After completing pancake your braid just to make it more fuller and voluminous. This is same as the elastic braid,all you need to do is just flipping the small pony tails inwards. Middle part your hair and take two small sections of hair from either side to the back and tie those sections with an elastic. Continue the above step until you reach nape of your neck and secure it with an elastic. If you want take small section of hair and wrap it around the elastic just to hide the elastic and bobby pin it. This is a cute everyday hairstyle.This can be done on any type of hair. Firstly, grab some section of hair from your crown area and make a puff. 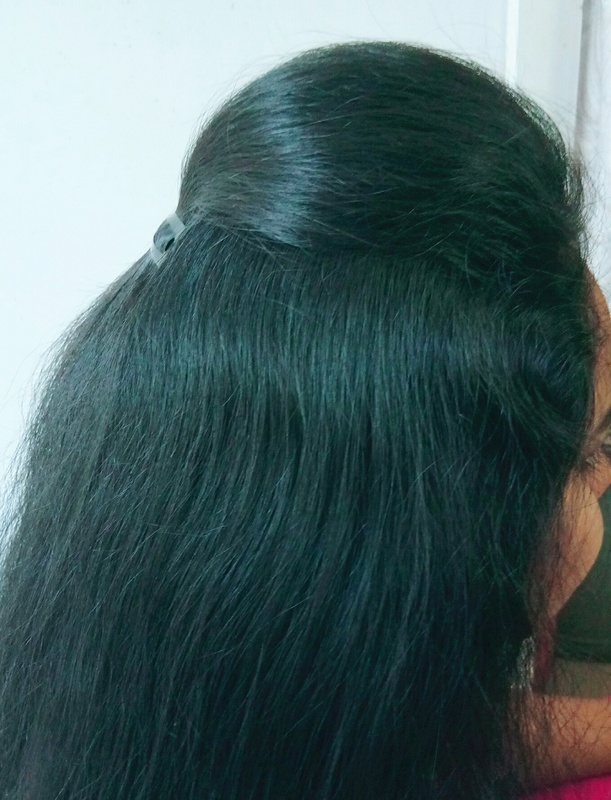 Now make a high pony tail and take small section of hair from the side of the pony tail and make a fish tail braid and secure it with an elastic. 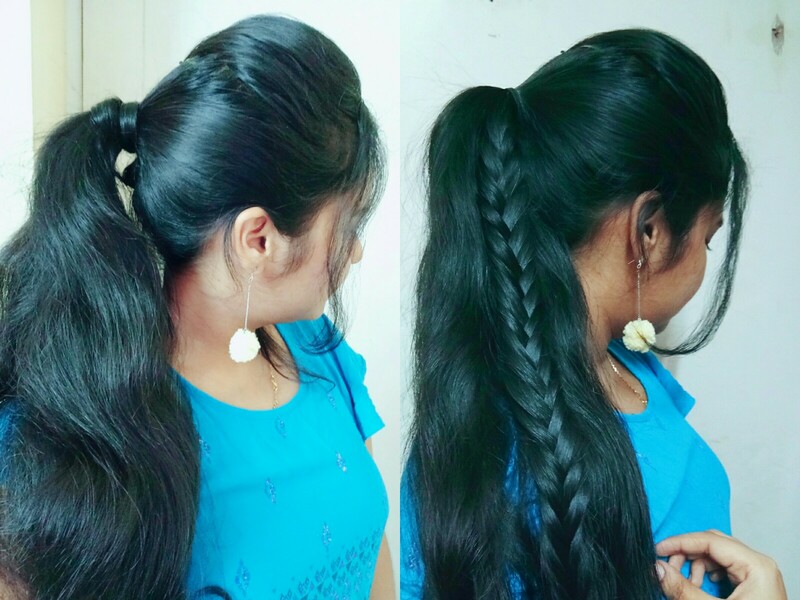 Knotted braid is a super easy hair-style which works perfectly on medium length hair to long hair.Before starting make sure that your hair is not frizzy just to avoid fly aways and for more polished look.This will work on both curly and straight hairs.Let’s get started! 1.Start by making a small pouf by taking a small section of hair at the top and secure it tightly. 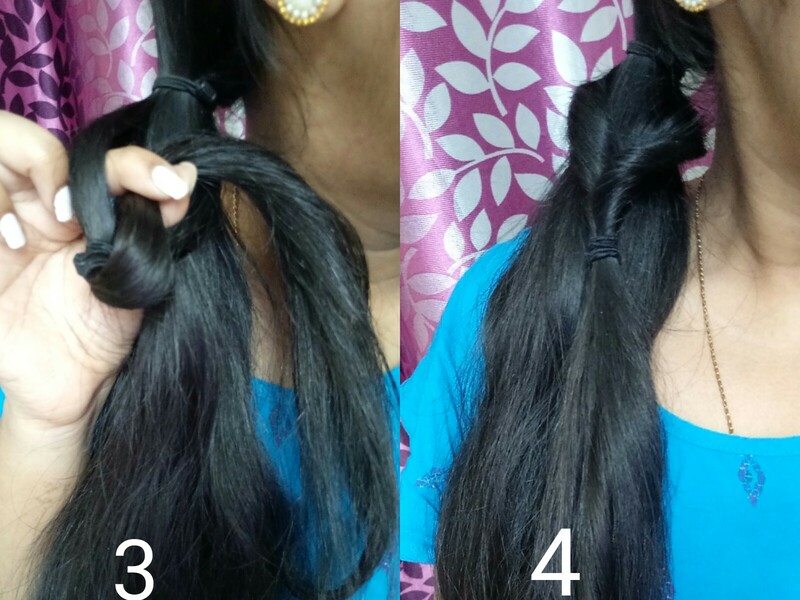 2.Take small sections from either sides of your hair and make a regular knot and make sure that the knot is tight. 3.Take another two small sections from either sides and now add the above old left section to the new left section and old right section to the new right section. 4.Now again make a regular knot with those two sections and hold it tightly. 5.Repeat the above steps until you reach the nape of your neck. 6.Now secure it with an elastic and if you have short hair then tug the remaining hair inside the hair loop and secure it with bobby pins and U-pins.But if you have long hair make a pony tail or a bun and for more volume pancake the knots . Ta-da this is the final look of the knotted braid.